Your outdoor living space doesn’t have to go dormant in the winter. One of the great advantages to living in Fort Worth is the mild weather we enjoy in the winter months. With the right addition of outdoor lighting and seasonal color, Blooms Landcare will help you enjoy your patio throughout the year. With the right landscaping, you can have a brilliant explosion of color in your yard for the entire year. We have trained landscapers on hand who will work closely with you to develop and install landscaping that looks amazing, suits your maintenance needs, and adds color to your yard. With the right Fort Worth landscaping, your backyard environment will be ready for entertaining even during the winter months. 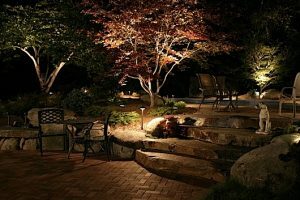 In addition to landscaping your backyard environment, we can also make it safer and more attractive with the addition of outdoor lights. Soft lights illuminating the deck make it easy to enjoy the area in the evening, and spotlights illuminating flowerbeds allow you to enjoy the brilliant color even after the sun starts setting in the evenings. Soft landscape lights illuminate the property without creating extra shadows around trees or other structures. You can view the property from inside your home to ensure that everything is in order and safe. Criminals will not be as likely to target your house because the lighting makes it harder for them to hide. Lighting also makes your property safer for family, friends, and other guests when they come to visit. Not only do they add attractiveness to your yard, but the added visibility along garden paths and paved walkways makes it easier to navigate the property without fear of falling. From improving the curb appeal of your home to making the property safer, there are many benefits to adding beautiful outdoor lights to your home. With the right winter lighting, you can enjoy your beautiful seasonal landscaping even after darkness covers the Fort Worth landscape. Call Blooms Landcare at (817) 688-5352 to discover how the right landscaping and lights can transform the exterior of your home.